The night the Chicago Cubs won the World Series, I knew, then and there, that there was only one book on the Chicago Cubs and the 2016 season that I wanted to read — David Ross’s. One hadn’t been been announced yet, but it was inevitable, just as it was inevitable that there would be a dozen (or two!) books on the season within a year. I expected books from most every player, Cubs beat writers, fringe fandom figures. A book from Wrigley’s janitorial staff on the 2016 season wouldn’t have surprised me. When Scott Simon’s My Cubs: A Love Story was announced, the number of books I wanted to read increased to two. Simon, the host of NPR’s Weekend Edition Saturday, has been a part of my life for the better part of the last twenty years. His voice — rich, distinguished, measured and warm — has the assurance of the radio men of old, the latest in a line that stretches back through Robert Siegel and Bob Edwards back to Edward R. Murrow and the Golden Age of Radio. Simon invites listeners into his world, makes them feel at home, and tells them stories, painting pictures with his voice, whether he’s reporting on the death of four Boy Scouts in Iowa or interviewing one of my favorite bands. A Chicagoan, one of Simon’s favorite topics is the Chicago Cubs. Simon wears his Cubs fandom like a battered yet beloved baseball cap, part of his identity and something that shaped him into the person he is. Whether he’s offering a paean to Wrigley Field or telling the story of his uncle, 1940s Cubs manager Charlie Grimm, and a famous Norman Rockwell painting, Simon’s love for the Cubs — the team, the culture, the history, the city of Chicago itself — shines through, and in My Cubs: A Love Story Simon pulls a lifetime of memories together to tell the story of his love affair with the Cubs. Simon: And these ‘Little Bears,’ how victorious were they in battle? Delaney: They were reputedly cursed by goats and a black cat as well, and when they were overrun by the invading Vikings in the eleventh century, no more was written of them. Simon: Fortunate for my Cubs, then, that today’s Vikings play an entirely different sport. The stories Simon tells — playing baseball in Chicago’s alleys in his youth, sitting with Jack Brickhouse in the reporters’ lounge at Wrigley in his high school years, sharing his love of the Cubs with his daughters and practicing to throw out a first pitch at Wrigley, weighing whether or not he even wanted to attend a World Series game in case he was the Cubs’ jinx… and then making friends in the stands — may be specific to Simon’s life yet the feelings of passion for the Cubs and of the community of fandom are universal: the Cubs are a shared language that transcends time, bonding generations into a family bound by love, triumph, heartbreak, and hope. In the opening pages of My Cubs, Simon recounts a dream of pitching in the World Series alongside Cubs legends from the distant past (Mordecai Brown), the remote past (Ernie Banks), the recent past (Ryne Sandberg), and the present (Kris Bryant), showing that even history that exists only in still photographs and dry newspaper accounts, history that has fallen out of living memory, lives on today, shaping and informing the present, still making its influence felt. As Delaney would note, stories bear within them an innate power of their own, and the more people who share those stories, invest themselves in those stories, and carry those stories with them the more power, the more reality those stories have. Simon himself noted in an essay for the Wall Street Journal that a single baseball game has all the tension and twists of a classic literature. Baseball, more than any other sport, celebrates and embraces its past as living history, part of an ongoing conversation that stretches back a hundred and seventy years to Eylsian Fields, and My Cubs is Simon’s own conversation with the Cubs and their history, a history that intertwines with Simon’s own history yet also one that, like Mordecai Brown, pre-dates Simon’s lifetime yet still lives on and influences Simon’s life today. Cubs fandom is a shared dream that lives on in the hearts over everyone who has loved the Chicago Cubs, felt hope on Opening Day, felt heartbreak at a crushing loss, felt sorrow when a loved one died without seeing their Cubs win it all, shed tears that November night when the Cubs finally did. Stretching back through time, all the way to Cap Anson and the Chicago White Stockings, there have been perhaps a hundred million Cubs fans and a hundred million different reasons for loving the Cubs. My Cubs: A Love Story tells the story of Scott Simon’s reason for loving the Cubs. Personal and intimate, funny and melancholic, Simon’s stories should strike a familiar chord in the heart of every Cubs fan, even those, like me, who are long-distance fans for whom a trip to Wrigley (as I took this year) is a once-in-a-lifetime experience. Simon paints a picture with his words and takes his readers on a journey into Chicago, into his life, into his love for the Cubs with that familiar voice and his lyrical prose, making his Cubs our Cubs, too. 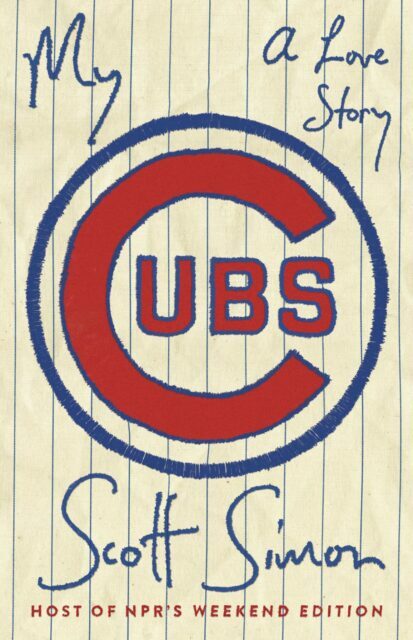 My Cubs is a book that only Scott Simon could write, and I savored every word. Next Next post: Did Amelia Earhart Survive?